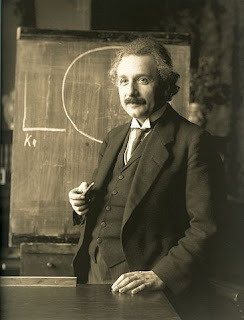 OpenScientist: Was Einstein a Citizen Scientist? Was Einstein a Citizen Scientist? Everybody starts somewhere. A young Michael Jordan lost countless basketball games to his older brother. Abraham Lincoln lost many political races before becoming President. Vincent van Gogh couldn't sell a paintings for a $1 that now hang in museums. And Albert Einstein was just an everyday citizen scientist. Just like the rest of us. Walter Isaacson's "Einstein: His Life and Universe" shows how a man with a desire to learn and dedication to science can go from being shunned by world of academia to being embraced by it. His ideas came from completely outside the professional establishment. But they were so ground-breaking, and so correct, he forced the world to notice him. "His slow development was combined with a cheeky rebelliousness toward authority, which led to one schoolmaster to send him packing and another to amuse history by declaring that he would never amount to much. These traits made Albert Einstein the patron saint of distracted school kids everywhere. But they also helped to make him, or so he later surmised, the most creative scientific genius of modern time." After graduation Einstein ran into another of his many difficulties breaking into academia as his parents were unable to afford a university education. Returning home he worked in the family electrical engineering business, but soon found his way back to Zurich Polytechnic. His eventual graduation from Zurich also led to frustration as he would wait another nine years before being offered his first academic job as a junior professor. All leading him to the famed Swiss Patent Office. He soon learned that he could work on the patent applications so quickly that it left time for him to sneak in his own scientific thinking during the day. "I was able to do a full day's work in only two or three hours," he recalled. "The remaining part of the day, I would work out my own ideas." ... He came to believe that it was a benefit to science, rather than a burden, to work instead in "that worldly cloister where I hatched my most beautiful idea. ".....In addition, his boss Haller had a credo that was as useful for a creative and rebellious theorist as it was for a patent examiner: "You have to remain critically vigilant." Question every premise, challenge conventional wisdom, and never accept the truth of something merely because everyone else views it as obvious. Resist being credulous. "When you pick up an application," Haller instructed, "think that everything the inventor is saying is wrong." All this work paid off during his "Miracle Year" of 1905. In four brief papers published in the Annalen der Physik, he would upend the physics world and make a name for himself in the annals of history. Photoelectric Effect: Showed that light energy is absorbed and released by atoms in discrete amounts. Brownian Motion: Helped prove the theory of atoms by showing how their motion could be visually detected under a microscope. Special Theory of Relativity: Established that the speed of light remains constant regardless of the speed of the observer. To quote Isaacson, "This was all quite presumptuous for an undistinguished Polytechnic student who had not been able to get either a doctorate or a job." Though he would earn that Ph.D. later in the year. Even this would not be enough for the establishment to immediately accept him. While he convinced the editors to publish his papers that didn't mean other scientists had to accept what was in them. Some thought his arguments were too "Jewish". Others thought they were too conceptual and not what a true "Englishman" would argue. In fact it was only as the many predictions made in those papers came true that the physics world would begin accepting the correctness of his arguments. But slowly they do. In 1908 Einstein received his first true academic job and in 1921 he would receive the Nobel Prize for Physics. He would then go on to a distinguished life in both Europe and America while continuing to search for a unified theory that would combine electromagnetism with his theories on gravity. But his greatest successes were those performed by himself, outside of academia, with no support but his own mind and government salary. Despite the prejudices against jews that kept him (and his ideas) out of certain prestigious schools, an intellectual background improved by academia but founded on self-motivated learning, and a lack of acceptance of his ideas by others, he upended the physics world. Modern observers only see the man and his success, assuming he was always accepted. But we give the scientific establishment too much credit if we think he came from that community. He was a citizen scientist with very independent (outrageous!) ideas, and we forget how lonely he must have been knowing his ideas were right while being continually ignored. To me it's a reminder of the vital importance of independent outsiders taking a fresh look at what is assumed to be true. Science is built on over-turning previously held assumptions and the outsider is a great source of these fresh new perspectives. Had he been consigned instead to a job of an assistant to a professor, he might have felt compelled to churn out safe publications and be overly cautious in challenging accepted notions. As he later noted, originality and creativity were not prime assets for climbing academic ladders, especially in the German-speaking world, and he would have felt pressure to conform to the prejudices or prevailing wisdom of his patrons. "An academic career in which a person is forced to produce scientific writings in great amounts creates a danger of intellectual superficiality," he said...As a result, the happenstance landed him on a stool at the Swiss Patent Office, rather than as an acolyte in academia, likely reinforced some of the traits destined to make him successful: a merry skepticism about what appeared on the pages in front of him and an independence of judgment that allowed him to challenge basic assumptions. There were no pressures or incentives among the patent examiners to behave otherwise. All of this confirms our titling Albert Einstein a great citizen scientist and an independent thinker we are proud to call one of our own. Hey buddies please grab the xbox free codes from the mentioned website. Also grab free offers from xbox for free in seconds. Visit to explore more. Online education system is proves that the education is more important than other works and the education is gives an awareness and knowledge to proves students future. Students have to do this for their bright career and gain information in short time. Students can easily avail that opportunity to improve their study and get a high level job position in big company. A friend of mine is also enrolled in online education system and got a life experience degree accredited with well experienced. Terrific advantageous blog! At this time, I’m gratified immediately following overlooking this approach content. I must tell you I love all the loyalty you'll use to make sure you reveal to you such type of around! In these days just click right Cash Advance Oceanside Prefer implement like to have a look at a lot more minor changes because of you. some times student have many huddles steps in life. some of them cleared hurdles and some them are not cleared that so he or she gets stress this impact in her direct mentally life. so don't be worried and get buy valium online from the online store for u.